Casablana is the story of a man torn between his love for a woman and the lives of countless resistance fighters hanging in the balance against Nazi Germany. The African Queen tells the timeless tale of two mismatched strangers joining forces in a common cause - and finding love along the way. Casablanca raconte l'histoire d'un homme dechire entre son amour pour une femme et les vies de nombreux combattants engages dans la Resistance contre l'Allegmagne nazie. La Reine africaine est l'histoire intemporelle de deux etrangers mal assortis qui font cause commune... et trouvent l'amour chemin faisant. 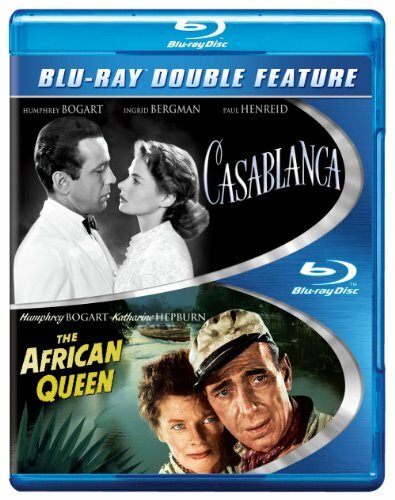 Posted on March 17, 2013 March 5, 2016 Author adminCategories ClassicsTags 1942, 1951, African, Casablanca, Humphrey Bogart, Ingrid Bergman, John Huston, Katharine Hepburn, Michael Curtiz, Paul Henreid, Queen, Robert Morley, Warner Bros.